This would probably be the final intraday charts update of 2017. With that said, let’s take a stroll down memory lane as we check up on our old setups on AUD/JPY and AUD/USD. And as always, we’ll be lookin’ for fresh plays as well. 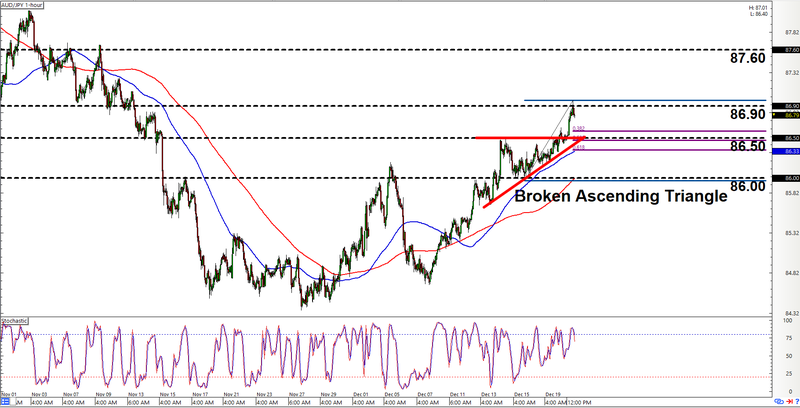 Back on December 15, we noted that AUD/USD appeared to be hesitating at 0.7690. We therefore expected the pair to pull back. And we setup a Fibonacci retracement play so that we can find an opportunity to jump in with a long. Well, the pair did pull back. But as y’all can see, the pair then opted to trade sideways, forming that there fresh symmetrical triangle in the process. However, the chart pattern also looks like a bullish pennant if we also take into account the bullish surge before the pair began consolidating. If what we’re lookin’ at is a pennant, then our main directional bias is to the upside. And we’re waiting for a clear break past 0.7690, with the expectation that the resulting rally will likely have enough momentum for a 190-pip move. But if that there is a symmetrical triangle, then we still have the same upside expectations. 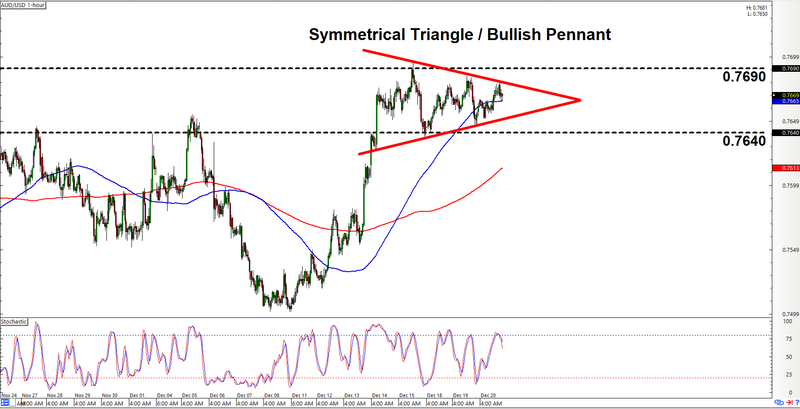 However, a symmetrical triangle also has a chance of breaking to the downside, so it may be prudent to prepare for a downside scenario, especially if the pair takes out 0.7640, since that would validate the downside break. If y’all can still recall, we found an ascending triangle on AUD/JPY’s 1-hour chart in yesterday’s intraday charts update. Well, that broke to the upside as expected, which is pretty dope. However, the pair quickly found resistance at 86.90. There’s therefore a good chance that the pair will pull back before resuming its upward push. And using our Fibonacci tool, we can see the the 50% retracement level is the key pullback area to watch since it’s just below the broken resistance area at 0.8650. And if the pair does retrace and 0.8650 holds as support, then them bulls will likely be gunning for 87.60 next. Do note, however, that if the retracement is much deeper and moves lower past 86.00, then that ain’t a retracement no more. In fact, that’s an early sign of a trend change, so y’all may wanna bail yo long if you still have ’em then. In any case, just remember to always practice proper risk management, a’ight?